Merchandising companies sell products but do not make them. Therefore, these companies will have cost of goods sold but the calculation is much easier than for a manufacturing company. Expenses for a merchandising company must be broken down into product costs (cost of goods sold) and period costs (selling and administrative). Just like all income statements, the first line is revenue. In the case of a business that sells a product, we refer to revenue as Sales or Sales Revenue. This lets the reader know that the company generates its revenue from the sale of products rather than the delivery of services. Next, we subtract cost of goods sold. Cost of goods sold is the cost of all the products (goods) that were sold during the period. If the company uses a perpetual inventory system, cost of goods sold is being calculated every time a sale takes place. In this case, no calculation is needed. We can simply take the amount from the cost of goods sold account on the trial balance. And you thought you could forget everything from financial accounting! If the company uses a periodic inventory system, we must do some calculations to figure out cost o f goods sold. Under a periodic inventory system, all goods purchased as placed in the Purchases account, not the inventory account. When sales are recorded, there is no adjustment to inventory and cost of goods sold like there is in a perpetual system. Therefore, at the end of the year, we must look at how much was purchased and physically count how much inventory is left in order to manually calculate cost of goods sold. Under a periodic system, we add beginning inventory to the cost of purchases. This gives us goods available for sale. Goods available for sale is the maximum value of goods that could be sold. If we sold every unit we had on hand and had no inventory left at the end of the year, goods available for sale would equal cost of goods sold. If there is inventory remaining, we must subtract the ending inventory from goods available for sale to calculate cost of goods sold. Let’s look at an example to help illustrate the point. 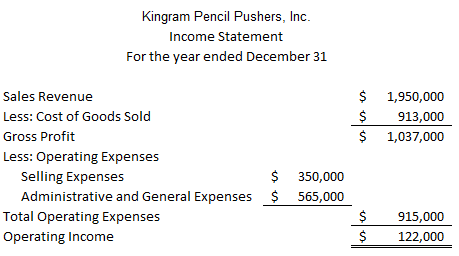 Kingram Pencil Pushers sells pencils to office supply stores and other retailers around the world. On January 1, the company’s inventory was $41,000. During the year, the company purchased $895,000 worth of pencils. A physical count of the inventory on December 31 revealed that there were $23,000 worth of pencils remaining. Calculate cost of goods sold for the year. Whenever you are working on a word problem, the first thing you want to do is remove the numbers from the problem and label them. We are told that January 1 inventory is $41,000. How would you label this number? If you said beginning inventory you are correct. January 1 is the beginning of the year, hence our beginning inventory. How would you label $895,000? Well we are told this is what the company purchased, therefore this is the amount of our purchases. Can you guess what the last number is? Ending inventory! If January 1 is the beginning of the year then December 31 is the end of the year. What is the problem asking us to do with these numbers? Calculate cost of goods sold. Okay, let’s think about this logically. We need to figure out what we sold. Now we can jump to the formula or we can try to think this through without the formula. What is cost of goods sold? It’s the stuff we sold, therefore it is no longer in the building. So if we take the stuff we could have sold (goods available for sale) and subtract the stuff we have left, we can figure out what was sold. What is the maximum amount of goods that were available for sale? Well we had some pencils, $41,000 worth of pencils actually. Then we purchased more pencils, $895,000 worth. So if we add the pencils we had, plus the pencils we bought, that tells us how many pencils we had available that could have been sold. So we could have sold $936,000 worth of pencils but we know we had some pencils left so our cost of goods sold must be less than $936,000. Cost of goods sold CANNOT be more than goods available for sale. I can’t stress this point enough because this is where a lot of people mess up this calculation. If you keep in mind that cost of goods sold cannot be more than goods available for sale, it might save you points on your next exam. I have $23,000 worth of pencils leftover. These pencils were not sold. So if I take the number of pencils I could have sold and subtract what I did not sell, that will tell me what I did sell. Of the $936,000 in pencils we could have sold, $913,000 were sold. That is the answer to the problem. This is called the traditional format income statement. Later on in the course, we will discuss another format for the income statement called the contribution margin income statement. This statement breaks out costs into product and period costs. Gross profit is the amount from sales that is left over after your product is paid for. This is an important figure for many companies because it lets the company know the average percentage of each sale left over to cover operating expenses and generate profit. You will notice that there is less detail in this statement than there was in the service company income statement. You can add all the detail if you wish but many times that causes the statement to become a bit cluttered, especially if you are putting in a subtotal for selling expenses and another for administrative expenses. Many times selling and administrative expenses are called operating expenses. These terms are used interchangeably. Sometimes, you will just see operating expenses or selling and administrative expenses and the total without the breakdown shown above. This format is also perfectly acceptable. When creating the income statement for a merchandising company, it is important to break costs out into product costs and period costs. If you are working with a company that uses a perpetual inventory system, cost of goods sold will already be computed for you. In a period system, you will have to do some calculations to compute cost of goods sold. Focus on what is actually happening, the business process, and the calculations are much easier. Don’t forget to calculate gross profit (sales – cost of goods sold). Operating expenses and selling and administrative expenses can be used interchangeably to refer to period costs. Kristin – you are a godsend! I am tutoring my daughter in her Big Ten School accounting class and this is by far the best document out there to explain to her what is going on in simple terms!! Thanks so much for making these available! You rock!! You’re welcome! Thanks for your comment. I appreciate it. Glad I could help.